This article is about the instrumental. For the song by Ultravox, see Sleepwalk (song). For other uses, see Sleepwalker (disambiguation). 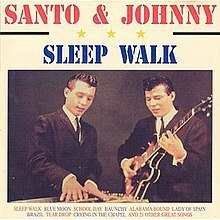 "Sleep Walk" is an instrumental tune written, recorded, and released in 1959 by brothers Santo & Johnny Farina, with their uncle Mike Dee playing the drums. Prominently featuring steel guitar, the song was recorded at Trinity Music in Manhattan, New York City. "Sleep Walk" entered Billboard's Top 40 on August 17, 1959. It rose to the number 1 position for the last two weeks in September and remained in the Top 40 until November 9. "Sleep Walk" also reached number 4 on the R&B chart. It was the last instrumental to hit number one in the 1950s and earned Santo & Johnny a gold record. In the UK it peaked at number 22 on the charts. The Brian Setzer Orchestra recording of "Sleep Walk" received a Grammy Award for Best Pop Instrumental Performance of 1998. "Sleep Walk" was a principal inspiration to Fleetwood Mac founder Peter Green for his 1968 instrumental "Albatross", which became a worldwide hit. "Albatross" in turn inspired the Beatles song "Sun King" from Abbey Road. The song "Sleepwalking (Couples Only Dance Prom Night)" by the band Modest Mouse, from their 1996 EP Interstate 8, drew inspiration from "Sleep Walk" in its melody, with the main addition to the original being added vocals/lyrics. Deftones included "Sleep Walk" on their 2011 album Covers which is a compilation album of cover songs. ^ Bronson, Fred (1992). Billboard Book of Number One Hits. New York, New York: Billboard Publications, Inc. p. 58. ISBN 0-8230-8298-9. ^ [dead link] "All Songs Considered Episode 13". NPR's Online Music Show. NPR. 2002-02-06. Archived from the original on 2007-06-22. Retrieved 2007-09-01. ^ [dead link] "Billboard #1 Pop Hits — 1950-1959". Record Research Inc. Archived from the original on 2005-06-10. Retrieved 2007-09-01. ^ Whitburn, Joel (2004). Top R&B/Hip-Hop Singles: 1942-2004. Record Research. p. 512. ^ "Santo & Johnny Bio". ^ "Official Charts". Retrieved 18 December 2015. ^ "Grammy Award winners (Brian Setzer)". Archived from the original on 2007-09-30. Retrieved 2007-08-30. ^ Rooksby, Rikky (2004). Fleetwood Mac: The Complete Guide to Their Music. Omnibus Press. p. 17. ISBN 1-844494-27-6. ^ "Chicago Tribune: "With 'Sleepwalking,' Modest Mouse drew inspiration from existing material"". ^ Punknews.org. "Deftones to release "Covers" LP for Record Store Day". www.punknews.org. Retrieved 2019-01-17. This page was last edited on 28 January 2019, at 19:55 (UTC).